Chigwell was a local government district in south west Essex, England. It contained the settlements of Chigwell, Loughton and Buckhurst Hill; and formed part of the Metropolitan Police District. In 1948, the New Works Programme of the London Passenger Transport Board brought the London Underground services of the Central line to six stations in the district; namely Roding Valley, Chigwell, Grange Hill, Buckhurst Hill, Loughton and Debden. The large LT Hainault depot was also mostly in the U.D. The coat of arms were granted in 1951 and represent Or, a stag at rest proper, on a chief gules three axe-heads bendwise sinister with blades down-words argent. 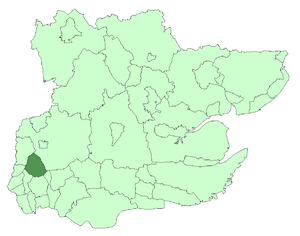 The Royal Commission on Local Government in Greater London considered the entire district for inclusion in Greater London, however after strong local resistance, only a small area of 81 acres (330,000 m2) around Hainault was transferred from the urban district and Essex to form part of the London Borough of Redbridge in Greater London in 1965. The population of this area in 1961 was 7,071. 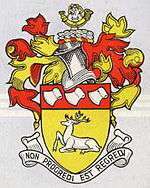 On 1 April 1974 the remainder of the district was abolished by the Local Government Act 1972 and the area has since formed part of the Epping Forest district. 1 2 Chigwell: Introduction, A History of the County of Essex: Volume 4: Ongar Hundred (1956), pp. 18-22. Date accessed: 27 November 2007.